Alison Hawthorne Deming brings to her first collection of verse the kinds of scrupulous observation and clear-eyed analysis that characterize scientific inquiry as well as a poet’s eye for the telling moment. 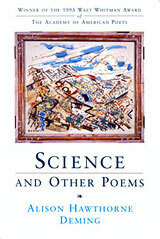 Science and Other Poems establishes astonishing parallels between the mute, inexorable processes of the physical universe and the dark mysteries of the human heart, parallels so clearly wrought and convincing that we wonder why we had not recognized them before. I greatly admire Alison Deming’s lucid and precise language, her stunning metaphors, her passion, her wild and generous spirit, her humor, her formal cunning. I am taken, as all readers will be, by the knowledge she displays and how she puts this knowledge to a poetic use; but I am equally taken—I am more taken—by the wisdom that lies behind the knowledge. I am amazed, and delighted, by her authority and tenacity. She is of this world; she lives in it, and for better or worse, it is the world she settles for; and she understands that, even if she must rage a little, and sometimes more than a little, she is one of its citizens. Like every original poet, she appears to have sprung full-blown—out of Zeus’ head I want to say—but Aphrodite is here as well as Athena, the ocean as well as the mountain. I congratulate her on this fine book. Alison Hawthorne Deming is a brilliant poet . . . With the best will in the world she goes to science for the matter of her poetry. She makes marvelously complex meditations that manage successfully to illuminate or instruct with verve and passion.